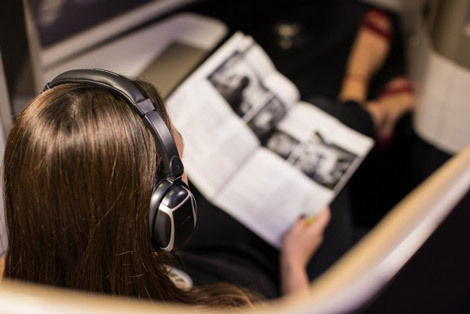 London based British Airways brings the cinema experience on board long haul flights with new headphones featuring 3D surround sound. The technology will be available to all passengers regardless of cabin, or whether they use their own headphones or a pair provided by BA. Creating an “immersive” experience with Spafax, the carrier said the 3D audio is “achieved by taking the original 5.1 surround sound mix and creating a stereo encode which can be used on any in-flight entertainment system”. I wonder if they are taking any influence from audio visual installation? I’m sure it’ll be fantastic anyway. Guy Ritchie’s retro-hit, The Man from U.N.C.L.E. Can you hear the difference between standard and 3D sound? BA has also started to roll-out a new range of headphones for passengers in every cabin. Those flying in First, Club World and World Traveller Plus will be able to use headphones with improved noise-cancelling technology; those in World Traveller will have new silicone-tipped earbuds with greater noise isolation and comfort, BA said. These are required to ensure that engine noise is blocked out as much as possible to allow the sound profile to project clearly. Spafax is one of the world’s leading providers of branded content solutions in the form of entertainment production and management, publishing and media sales for different airlines including: Virgin Atlantic, Air Canada, Singapore Airlines, Delta Air Lines, Malaysia Airlines, Cathay Pacific, Emirates and Lufthansa. British Airways is not the first to implement 3D audio in the UK. Virgin Atlantic introduced a similar concept with Spafax and Dysonics back in August 2015. The first two movies with 3D audio were Fast and Furious 7 (Universal) and Bessie (HBO). There is also a similar arrangement for Virgin America (to be introduced in the next version of Red). While the verdict is still out of whether the 3D sound profile comes across as clearly in the noisy airplane cabins. This technology would be very useful when virtual reality (VR) becomes more mainstream (Qantas Airways features VRs for first class passengers (News – February 4, 2015). British Airways brings better sounds to its entertainment system on board long haul aircrafts. Passengers would be able to enjoy a more cinematic experience with selective movies.